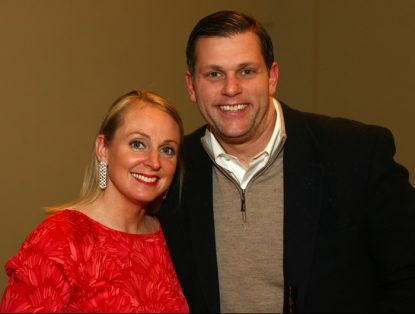 Maureen and Matt McFillin of Penn Valley, parents of students attending Regina Angelorum Academy, attend the school’s ninth annual St. Valentine’s Dinner Feb. 10 at St. Charles Borromeo Seminary. 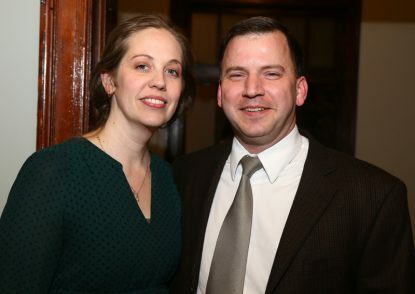 Friends and supporters of Catholic classical education marked National Marriage Week in the United States by gathering Feb. 10 at St. Charles Borromeo Seminary for Regina Angelorum Academy’s ninth annual St. Valentine’s Dinner. Deacon Chris Roberts of Martin Saints Classical High School in Oreland addressed 150 parents and friends of Regina Angelorum, including broadcaster Kathleen McCarthy of In His Sign Network and Regina Angelorum Academy founding board members, Brian Gail and Barbara Henkels. Also in attendance with their spouses were Fran Maier, senior adviser to Archbishop Chaput; Dr. John Haas of the National Catholic Bioethics Center, Dr. Brian Wojciechowski of the Catholic Medical Association, Brian Brown of the National Organization for Marriage, and Helene Hallowell, diocesan field promoter for the Couple to Couple League. Martin Saints Classical High School Headmaster Adam Dickerson attended the dinner with his wife Sarah. RAA parent and board member Dr. Daniel Cheely of the Collegium Institute for Catholic Thought and Culture introduced Deacon Roberts’ talk, “Love Is Our Mission: Marriage Fully Alive,” which referenced his work drafting the preparatory catechism for the World Meeting of Families in 2015. Deacon Roberts’ address explored the fullness of marriage as an intimate relationship with social implications. The talk emphasized sacramental marriage and chaste single life as twin postures that facilitate men and women’s living together in the mutually respectful harmony we were created to enjoy. He celebrated Catholic classical education as the surest means to preserve the cultural memory of the underlying purpose of these social practices.